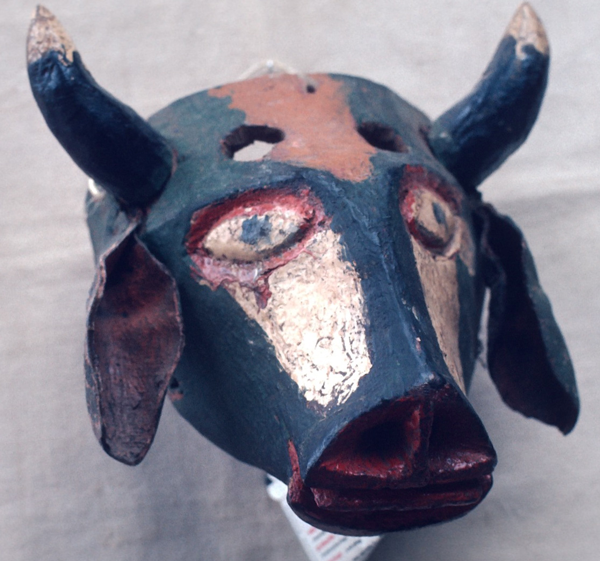 Today we will look at some more masks from the Urmston collection—Torito (Bull) masks from the area of Alta Lucero, Veracruz. Apparently this is a very popular category, as every one of these masks has already been sold. I apologize for the quality of these images, as some of the masks are not well illuminated and at least one is not well focused. These are scans from slides that were taken 35 years ago; it is far easier now to obtain sharp and well lit images with digital cameras. Dancers wearing Torito masks dance in Alta Lucero during Carnaval (Carnival or Mardi Gras). The first is nicely carved and has a typical design. According to a website about Alta Lucero, dancers wearing bull masks perform in “Las Danzas de Negros (Negreada),” but there is little further explanation. Continuing my discussion about masks from the Urmston collection, today I will present a variety of masks from the Mexican state of Veracruz. The Urmstons have been selling their collection, mask by mask, and today I will include many masks that are for sale. Because the Urmston collection is actively for sale, I can not guarantee that a particular mask will remain unsold by the time it appears on this site, and you are advised to act promptly to pursue any mask that does interest you. Note again that I have no commercial interest in these sales; I am simply relishing the opportunity to share this collection with interested collectors, whether to purchase or simply to learn from. You may contact the Urmstons at urmston@verizon.net. I will begin with a group of masks with male faces and interesting mustaches. All four are for sale at this time. The first has a mustache that has a corkscrew shape. This mask represents a Moor, from the Danza de los Moros y Cristianos. Today it is my pleasure to continue discussion about a collection of masks that were gathered by James and Jane Urmston in the 1970s, when they were living in Mexico. The Urmstons have been selling their collection, mask by mask, and today I will include masks that are for sale along with others that have already been sold. Because the collection is actively for sale, I can not guarantee that a particular mask will remain unsold by the time it appears on this site, and you are advised to act promptly to pursue any mask that does interest you. Note again that I have no commercial interest in these sales; I am simply relishing the opportunity to share this collection with interested collectors, whether to purchase or simply to learn from. You may contact the Urmstons at urmston@verizon.net. I will begin with two Catrin masks from Tlaxcala that appear during Carnaval (Mardi Gras). They were still for sale before I began this series of Urmston posts and appear to be very good masks. The first mask was brought in to a Santero (carver of saints) for repainting, some of the old paint was scraped away, but then the mask was never repainted. I suspect that the unpainted spots along the top edge had held islands of carved plaster to simulate hair, just as we still find on several masks that follow. This mask is very finely carved and has glass eyes. The wood has split under the right side of the mouth, but this is very typical of these older (1930s?) masks. This mask is a real “sleeper,” much better than you might think at first glance. 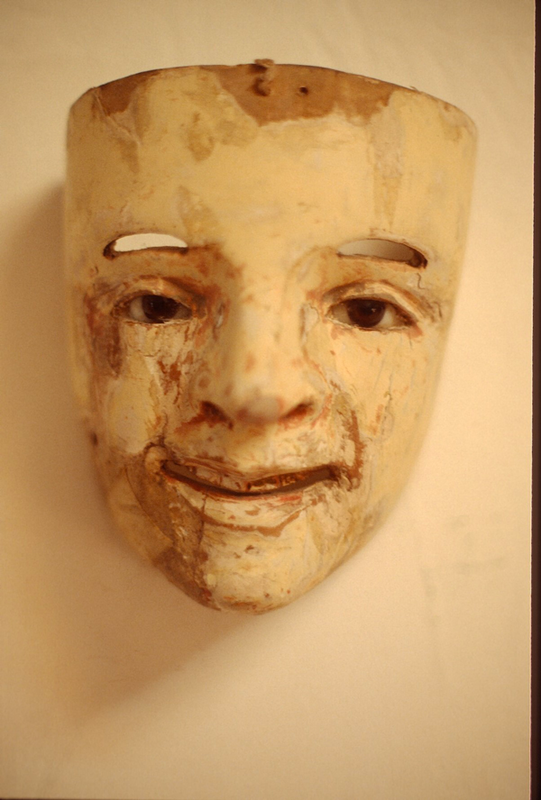 This is the fourth in a series of posts inspired by masks from the James and Jane Urmston collection. Today we will look at some masks that dance during Carnaval in Veracruz towns such as Alta Lucero and Tuzamapan. Jaled Muyaes and Estela Ogazón called these Moros de Carnaval (Carnival Moors).The Urmstons had just three of these masks, but those three were visually striking. They were apparently purchased in Naolinco, Veracruz, but I am assuming that they were actually used in Alta Lucero or Tuzamapan. The Urmstons have been selling their collection and all three of their Carnaval Moros were purchased and then offered for resale on the Colonial Arts site, where just one remains. In that listing the mask is called a “Card Faced Mask.” Here is a link to that site. 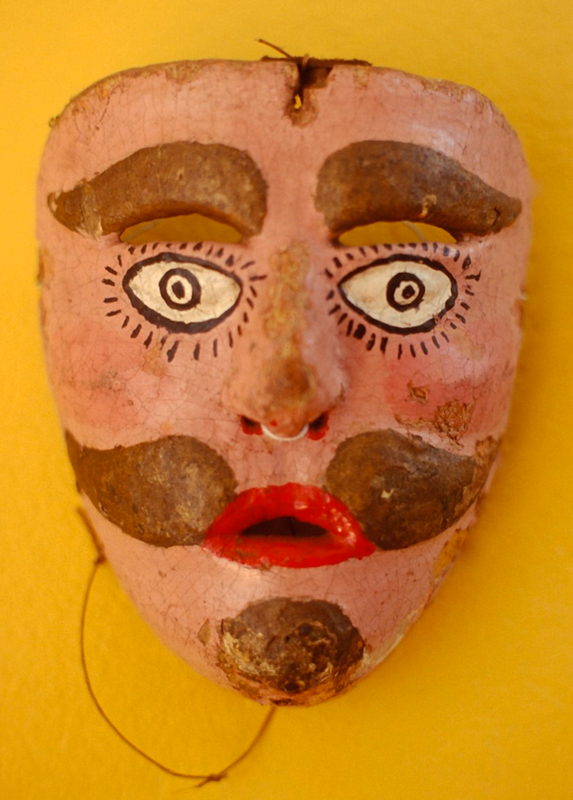 these masks can also be called Enamorados (essentially “lovers”) in Tuzamapan, Veracruz. That makes sense since many of these masks (but not all) have hearts painted on their faces and one of mine apparently includes the name of the dancer’s beloved. I might as well begin with the mask that is currently for sale by Colonial Arts. This photo and the two that follow are courtesy of the Urmstons. Isn’t this a splendid mask, with its relief-carved brows and mustache framed in these bright colors. This is the third in a series of posts that are based on interesting and important masks from the James and Jane Urmston collection of Mexican dance masks. I am using this collection as a springboard for exploration of Mexican mask traditions. The Urmstons are in the process of selling their collection. Because the collection is actively for sale, I can not guarantee that a particular mask will remain unsold by the time it appears on this site, and only two of their masks are featured in today’s post, the first and the last! You are advised to act promptly to pursue any mask that does interest you. Note that I have no commercial interest in these sales; I am simply relishing the opportunity to share this collection with interested collectors, whether to purchase or simply to learn from. You may contact the Urmstons at urmston@verizon.net. This week I will introduce a vivid dance from the town of Naolinco in the Mexican state of Veracruz. As you will see from a You Tube™ video that follows the first photo, this dance is usually referred to as a local version of La Danza de los Moros y Cristianos (the dance of the Moors and Christians), but it is far better understood as an example of the Santiagos (or Santiagueros) dance. For the curious, I will explain at the end of this post. In the Naolinco version, Santiago Apostol, who can also be called Santiago Caballero (Saint James with his dance horse) and two Santiagos (his lieutenants) oppose Pilato (Pontius Pilate). A group of Negritos (in this case “dark ones” or dark forces who clearly represent the dead) threaten and harass Santiago, while Los Caines (as in Cain the brother of Abel) mill about on the fringes of the action. Santiago and his Caballeros don’t wear masks, although Santiago does wear his usual dance horse, not unlike the larger one in my post of January 18, 2016. This is the only Mexican dance I know in which “Negritos” does not refer to African Americans. I will begin with a mask typical of those worn by the Caines dancers; this mask is from the James and Jane Urmston collection and it is for sale as of this writing. Then two Pilato masks and a number of Negritos masks will follow, all from my collection and NOT for sale. At the end there will be a second Urmston mask that is currently for sale. 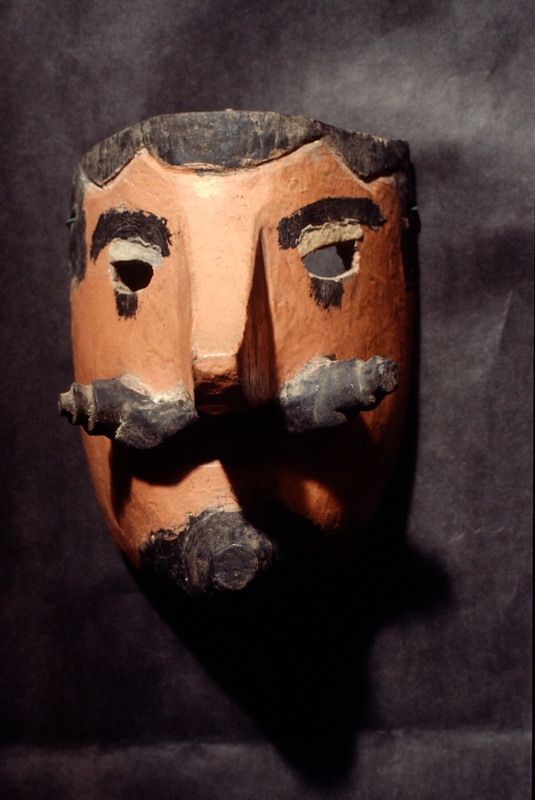 Here is the Caines mask from the Urmston collection. 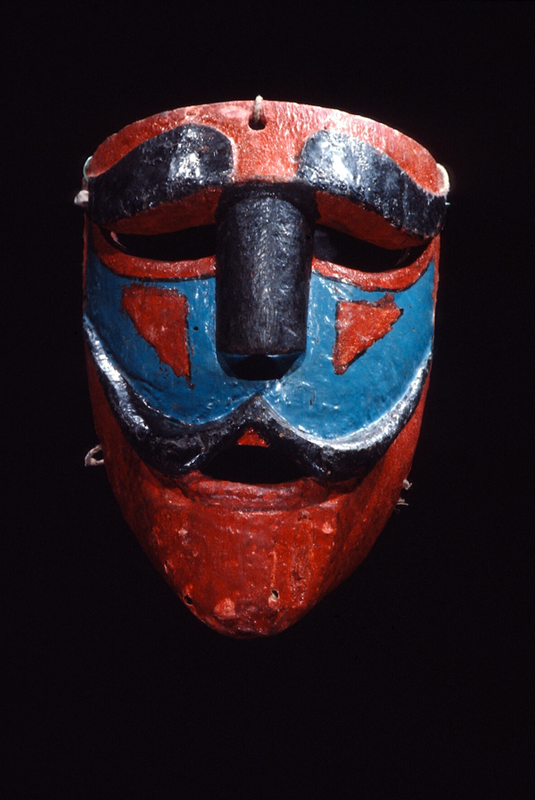 The general design features of the Caines masks for this dance include a pink face along with relief-carved brows, mustache, and goatee that are painted gold. Here is a video of this dance. The Caines dancers wear conical blue caps that are decorated with stars. The leader of their group is Sabario, who wears a red conical cap.